Modelling accessibility involves combining ideas about destinations, distance, time, and impedances to measure the relative difficulty an individual or aggregate region faces when attempting to reach a facility, service, or resource. In its simplest form, modelling accessibility is about quantifying movement opportunity. Crucial to modelling accessibility is the calculation of the distance, time, or cost distance between two (or more) locations, which is an operation that geographic information systems (GIS) have been designed to accomplish. Measures and models of accessibility thus draw heavily on the algorithms embedded in a GIS and represent one of the key applied areas of GIS&T. This entry was published on September 4, 2017. This Topic is also available in the following editions: DiBiase, D., DeMers, M., Johnson, A., Kemp, K., Luck, A. T., Plewe, B., and Wentz, E. (2006). Accessibility modeling. The Geographic Information Science & Technology Body of Knowledge. Washington, DC: Association of American Geographers. (2nd Quarter 2016, first digital). network: A collection of nodes, and links between nodes, that describe discrete movement opportunities in space. Often networks will have costs (weights) which describe the speed of travel along an edge, or constraints to movement at a node. Network analysis is one of the core areas of GIS&T analysis. shortest path: The shortest in terms of distance, time, or cost distance of multiple potential movement routes connecting two (or more) locations. See also least cost path. isochrone: A line of equal time travel used to map how far one can travel in a given amount of time from a particular focal location. constraints: Features of the environment or individual that limit or completely block potential movement opportunities. The first key question faced when modelling accessibility is how to represent the geographical space within which movement occurs. There are two fundamental representations of space commonly used in GIS&T, continuous space and network space (Figure 1). Continuous space represents the simplest and most common way to represent geographical space, and is done using a polar or Euclidean geometry. Spatial networks are more complex, and represent a discrete set of movement possibilities. Spatial networks are defined by a set of interconnected nodes and links between nodes that represent where movement is possible along the network. Within a spatial network many constraints may limit our movement, for example the presence of one-way streets or turn-limited intersections. The second key question faced when modelling accessibility is how to measure distance. There are three conceptualizations of distance that can be readily applied to each of the conceptualizations of geographical space: i) geographical distance, ii) time distance (or travel time), and iii) cost distance (Figure 1). Note that geographical distance (uniform cost) and travel time (time cost) are two very important special cases of cost distance. Figure 1. Different spatial and distance conceptualizations that are commonly employed when measuring and modelling accessibility. Geographic distance is defined as the linear measurement in geographical distance units (e.g., meters, kilometres, or miles) between two locations. For continuous space, geographical distance can be quantified using the Euclidean or Manhattan distance metric between two points. Euclidean distance measurements are incredibly powerful as they are easily and efficiently calculated using modern computing tools, and thus can be readily incorporated into analysis. However, most human movement occurs along a spatial network consisting of roads, railways, and paths. In fact, Euclidean distances are generally poorly suited to accurately measure distance across such complex spaces. For these types of network space, the geographical distance is defined as the summation of the edge distances that must be navigated to go between two points along the network. Finally, many applications consider measures of distance across a heterogeneous spatial field. In such cases, it is typical to compute a least cost path, which is the path between two locations that minimizes the impedances as defined by the spatial field. Least cost path models of accessibility are incredibly powerful way to study wildlife movement, but are also routinely used in siting new transportation routes and other pieces of linear infrastructure. Time distances (or simply travel time) can be calculated where additional information is provided on how to translate geographical distances into time. The calculations of time distances will typically be highly dependent on a mode of travel (e.g., walking vs driving). The calculation of travel times between locations is one of the core functions associated with GIS-based network analysis and is heavily embedded in modern navigation applications (e.g., Google Maps). Similarly, following the framework outlined by Miller and Bridwell (2009), the time associated with least-cost paths can be readily calculated in a GIS. Finally, cost distances are the most generalizable form of distance, as both geographic distance and time distance are special cases of a cost distance. 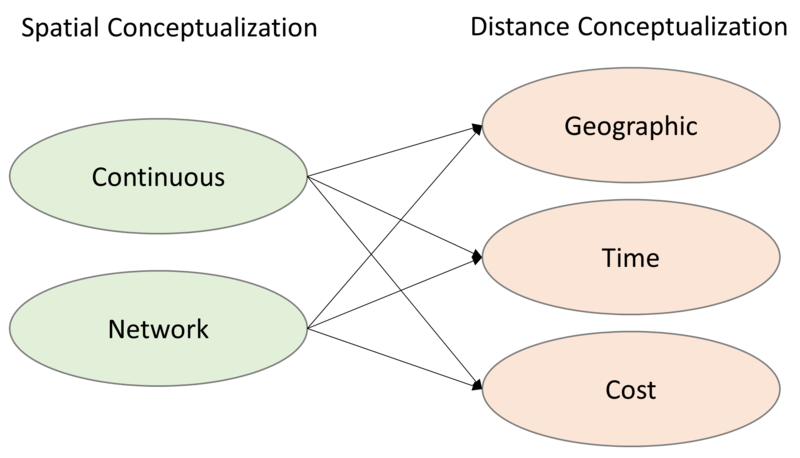 A cost distance is used to describe the cumulative impedance (i.e., the cost) along a route from location A to B. Computing cost distances requires a further set of information regarding the nature of the impedances which can be readily constructed for both continuous and network definitions of space in a GIS. Cost distances might relate to, for example, the energy consumption required to traverse a route by an electric car, the calories burned by a cyclist, or the financial cost of various forms of public transportation. Costs may also relate to less tangible elements of travel, for example, Alivand et al. (2015) evaluated how route-choice in the state of California is influenced by scenery. Measuring accessibility requires quantifying the opportunities for movement (access) to different services, goods, and activities (hereafter destinations). Thus, accessibility is influenced both by the location of an individual to the locations of potential destinations (and the distances between). Two factors are commonly considered in accessibility models i) distance; and ii) destination choice. Thus, measures of accessibility are a joint function of the distance (geographical distance, travel time, or cost distance) required to reach destinations and the number (and/or variety) of potential destinations available (Handy & Niemeier, 1997). While a number of potential measures have been proposed for measuring accessibility, for a variety of applications and purposes, generally they can be summarized into four categories: opportunity measures, gravity-based measures, utility-based measures, and space-time measures (Liu & Zhu, 2004). Opportunity measures count the number of potential destinations that can be reached within a given distance measurement for an individual. All potential destinations within the cut-off are weighted equally. Opportunity measures are straightforwardly calculated in a GIS using geographical buffers, network based isochrones (contour lines of equal travel time), or accumulated cost surfaces depending on the chosen distance conceptualization. Where Ai is the measure of accessibility for individual i, and vj is the (optional) weighting for the characteristics of the destination dij is the distance between the individual i and destination j, and f is a function for weighting the distance. Many potential functions could be used for f(dij), but typically choices are based on inverse distance or negative exponential functions. A criticism of gravity-based accessibility measures is that they can be difficult to interpret, for example there is no clear definition of what a high or low value should be, all analysis must be relative. Where Ai is the measure of accessibility for individual i, vj is the value or benefit from choosing destination j, β is a distance-based sensitivity parameter, and dij is the distance between the individual i and destination j. Thus, this type of accessibility measure evaluates the desirability of the full complement of destinations. Finally, space-time measures recognize that choosing a destination for a given activity requires consideration of several spatial and temporal conditions. Perhaps no better is this demonstrated than through the ideas associated with time geography, a powerful framework for understanding movement opportunities, and accessibility, in space and time (Hägerstrand, 1970). Through time geography a set of space-time structures, most notably the space-time prism, can be used to model individual accessibility in space and time. The space-time cone represents the accessibility space for an individual into the future (often called the future cone; figure 2a). An isochrone can be conceptualized as a slice of the space-time cone at a particular time. The space-time prism (figure 2b) represents the intersection of the forward space-time cone from an origin point in space-time and the past space-time cone from a destination point in space-time. The projection of the space-time prism onto geographical space is called the – potential path area. Space-time cones and prisms can be modelled using Euclidean space, network space (Miller 1991), and heterogeneous spatial-fields (Miller & Bridwell, 2009). Figure 2. a) space-time cone and isochrone, b) space-time prism and potential path area. Capability constraints – limit the accessibility of the individual because of their biological construction. For example, a physical disability may limit accessibility due to the absence of appropriate infrastructure. Coupling constraints – limit accessibility of the individual because of requirements to be at certain places at certain times. For example, face-to-face meetings require two individuals to be in the same place at the same time. Authority constraints – limit accessibility of the individual as they represent locations or times when movement or access is unavailable. For example, the opening and closing times of the library limit when it can be visited. Capability, coupling, and authority constraints are an often overlooked area in modelling accessibility within GIS&T, but can have substantial effects on accessibility models. For example, Neutens et al. (2010) demonstrate substantial variation in accessibility to public services in Ghent, Belgium owing to authority constraints associated with opening hours. Each accessibility measure can be further interrogated according to four components: i) the land-use component, ii) the transportation component, iii) the temporal component, and iv) the individual component (Geurs & van Wee, 2004). The land-use component refers to the physical arrangement of origin and destination locations across the landscape. The transportation component represents the structure of the transportation system connecting the origins and destinations, and in many cases would relate to using multiple modes of transportation (e.g., walk, bus, train). The temporal component refers to temporal constraints, relating the coupling and authority constraints introduced by Hägerstrand. Finally, the individual component reflects the capability constraints which are characteristic of an individual’s ability to travel, for example access to a car. The measurement of accessibility typically takes one of two perspectives place-based or individual-based (Miller, 2005). Any of the above accessibility measures can applied to an individuals’ specific location in space and time to calculate an individual-based measure of accessibility. Individual-based accessibility measures are possible when individual data are present, for example from geolocated cell phone records. In contrast, accessibility measures can also be calculated for specific places (e.g., bus stops, police stations, census blocs) to examine the geographical variation in accessibility via these measures. Place-based measures of accessibility focus on the location, and are often used in location-allocation models, to study where to place new facilities. Often it is useful to summarize the accessibility of regions (e.g., census blocs or counties) to generalize (and map) a measure of accessibility across the population. Aggregating accessibility measures can be done in a number of ways depending on the analysis needs and form of data in hand. The first, and simplest approach, is to choose a single representative location of the region and to compute the accessibility measure for that single location. Commonly the centroid of the region is taken, however there are many other potential ways this can be done, for example the population-weighted centroid. Another approach is to choose a number of locations within the region (either sampled randomly or based on existing data) and compute the measure of accessibility for each one; using a measure of central tendency to summarize for the region. This method is preferable when the existing data is present as it will reflect the real accessibility outcomes of the individuals, but also provide a range of potential accessibility scores which can be further analysed (i.e., do some regions have more or less variation in accessibility?). Other approaches take a more pragmatic approach, focusing on summarizing the accessibility of critical locations within a region (e.g., bus stops or ride share locations). All aggregation measures suffer from common issues associated with the aggregation process notably the ecological fallacy and its geographical sibling the modifiable areal unit problem (Openshaw, 1984). Thus, care must be taken to understand the effects and limitations associated with the chosen aggregation process when using aggregate measures of spatial accessibility. 5. What makes Accessibility Unequal? The underpinning reason for measuring and modelling accessibility is that we think it might influence some other process that we are observing. It is not surprising that variability in accessibility can arise between geographical locations or sub-groups of the population. For example, using GIS to construct a space-time measure of accessibility Kwan (1999) found that accessibility to urban opportunities (e.g., shopping, food, entertainment, recreation) was significantly lower for women compared to men in a travel survey conducted in Columbus, Ohio. The reason for this variation however can be difficult to understand, owing to the fact that accessibility is a function of the spatial-temporal characteristics of both the origin (individual or region) and destinations. Thus, the presence of unequal access may be attributed to individual (or origin) effects and destination effects. Solutions for making access more equitable can thus focus on either of the origin or destination. Origin driven solutions attempt to improve the movement opportunities of individuals (or regions), for example by improving public transit options. Destination driven solutions attempt to improve the provision of destinations, for example by adding or changing locations. Hägerstrand, T. (1970). What about people in regional science? Papers of the Regional Science Association, 24(1), 7–21. Openshaw, S. (1984). The Modifiable Areal Unit Problem. Norwich, England: GeoBooks. Sketch the different conceptualizations of space (data models) and distance on paper. Identify and discuss limitations associated with each type of analysis, including the necessary data required to utilize a given distance measure. Provide examples of situations where it would be appropriate to use one form of distance measure vs another in the calculation of accessibility measures. Identify the four classes of accessibility models and measures. Students can explain the general formulation of each of these models. Implement and interpret the four basic spatial accessibility measures in a GIS using available tools. Analyse the variation in accessibility measures statistically and across space. Explain how the ecological fallacy and modifiable areal unit problem relates to the use of aggregate measures of accessibility. Think about where you live and whether or not you think it has a high level of accessibility to local services. Give your home an ‘accessibility rating’ on a scale of 0 (low accessibility) to 100 (high accessibility). Compare your estimate to the score your home address receives from the walkscore website (www.walkscore.com). Try and come up with a list of the key applications where accessibility models are being used. Then conduct a literature search to identify some application areas that are using accessibility models that you had not thought of. Write down using step-by-step directions, or draw on a paper map, the route you take to get from home to work or school. Compare that to the directions provided by popular online navigation apps (e.g., Google maps or Bing maps). Using a GIS or Google Maps, compute an opportunity-based, gravity-based, and utility-based accessibility measure from your home to the five nearest grocery stores. Try and use the store floor area or how many hours it is open a week as the characteristic weighting value (vj). Compare the difference between travel time and Euclidean distance as a measure of distance. Haggett, P., Cliff, A.D., & Frey, A. (1977). Locational Models. London: Edward Arnold Ltd.